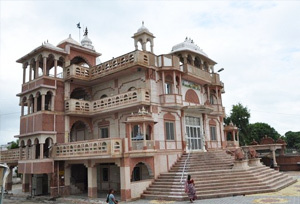 The Shri Mahavirji Jain Temple is situated in the district of Karauli in Rajasthan. The main deity here is that of the last and 24th Jain Thirthankara, Mahavira Bhagawan. This was established more than 200 years ago, thus it holds special significance for those who follow the tradition of Digambar in Jainism. The principal deity of Lord Mahavira which is established in this temple was originally found on a mound, where it miraculously appeared. The villagers excavated the idol only because they noticed a cow (a special Kaamduhadhenu) pouring its milk on the mound every day. When the villager grew curious they excavated the mound and were surprised at the appearance of the idol of Lord Mahavira. It was when the wishes of people who prayed to this deity started getting answered, a temple was constructed for the idol by Shri Amar Chand Bilala of Jaipur. This was later renovated in the 17th and then 19th century. The temple has enjoyed the patronage of the kings that ruled Jaipur as they provided generous grants that contributed in the upkeep and maintenance of this holy shrine. The original site of the mound has now been covered with an umbrella made of marble and is adorned with images that represent the feet of the Lord. The temple itself has imposing and attractive architecture. It is surrounded by many Dharmashalas. There are three pinnacles that are sky high in the temple. The original idol that bestows with devotess with miracles is installed in the main shrine. Here, Bhagwan Mahavir is seated in Padmasana Posture. Another iconic feature of this temple is the 52-feet high column on which the statues of four Tirthankaras are etched at the top. Mahavir Jayanti is the festival celebrated in this temple, lasting five days in the month of April, it draws millions of the faithful from all over the world.